When the now-legendary Clarisonic first entered the beauty market the buzz was almost deafening - and despite a pretty big price tag units just flew out the door. It wasn’t available in New Zealand for quite a long time, and I tried one overseas but could never really justify the outlay - and consequently never bought one home. 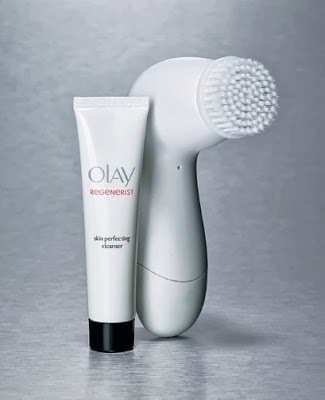 If you’ve been hankering for a Clarisonic too but can’t justify the high price for it, then the arrival in New Zealand of the Olay Regenerist Advanced Cleansing System is most excellent news - it’s the ideal way to see if brush cleansing system is right for your skin, at about a quarter (or less) of the price of a Clarisonic! The Regenerist Advanced Cleansing System is Olay’s first-ever state-of-the-art electronic cleansing device, which cleanses four times better and helps your skin absorb over 25 per cent more anti-ageing ingredients. Like the Clarisonic and many that followed it, it is designed to effectively loosen, lift and swirl dirt away to cleanse, exfoliate and reveal brighter smoother skin with each use. I love the fact that it has a micro-massaging action that removes even long-lasting, smudge-proof make up, yet is gentle enough to use every day – even when you have sensitive skin like mine. It is great for getting into crevices (for want of a better word) like the contours around the nose and reportedly cleanses four times better than basic cleansing, resulting in better active anti-ageing ingredient penetration so you get that much more out of your nightly skincare regime. I have found the Olay Advanced Cleansing System to be a lot gentler on my skin compared to the Clarisonic (especially the Pro version) and for daily cleansing it is an absolute treat. If you’re looking for a cleansing device at a very wallet-friendly price then this is definitely for you, and I love the fact that it is so light and therefore very travel-friendly. The Olay Regenerist Cleansing System is available now from leading pharmacies and supermarkets with an RRP of $34.49, and replacement brush heads are available at RRP $9.99 for a two-piece pack.